Cary, NC – November 7, 2018 – INDA, the Association of the Nonwoven Fabrics Industry, recognized Ralph Moody, PE, Senior Director of R&D, Berry Global, Inc. with its prestigious 2018 Lifetime Technical Achievement Award November 6, 2018 before 500 nonwoven and engineered fabric professionals November 6, 2018 during at the association’s annual Hygienix Conference, in Orlando, FL. “Ralph was selected by INDA’s Technical Advisory Board, a group of technical professionals from member companies, as most deserving for this year’s Lifetime Technical Achievement Award based on an evaluation of his career accomplishments and the Award criteria. Certainly, they were impressed with Ralph’s eleven patents, multiple machine start-ups, and leadership role on the Scientific Advisory Board of the Nonwovens Institute at North Carolina State University. 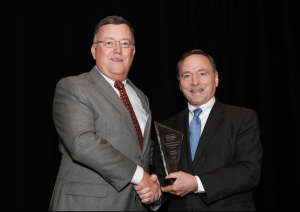 He is truly deserving of this prestigious award recognizing his career of service to the nonwovens industry,” said Dave Rousse, INDA President during his presentation of the award. Moody holds eleven patents in the nonwovens field and has been involved in the design and startup of ten nonwoven production lines (six in the USA, two in Europe, and two in China). During his career, he held critical roles in Johnson & Johnson (Chicopee), PGI Nonwovens, and now Berry Global, Inc.